Submitted by Quest-News-Serv... on Wed, 06/22/2011 - 18:44. [Space Weather CME Incoming]Space Weather News reports: CME Incoming ~ Magnetic fields above sunspot complex 1236 erupted in the early hours of June 21, producing a C7-class solar flare and full halo CME. Expanding cloud appears to be heading almost directly at Earth. 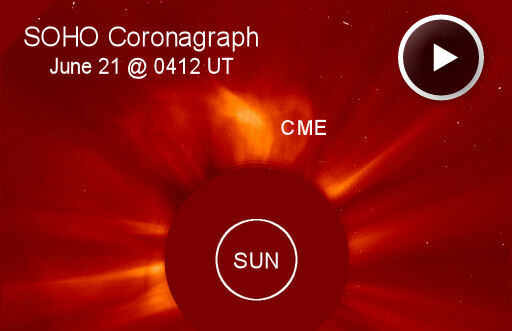 The incoming C7-class CME cloud could trigger polar geomagnetic storms when it reaches Earth on or about June 23rd…..http://www.spaceweather.com stay-tuned…. Submitted by Quest-News-Serv... on Wed, 06/22/2011 - 18:57. Submitted by Quest-News-Serv... on June 22, 2011 - 5:44pm. Submitted by westward on Fri, 06/24/2011 - 00:05. Hey, Guy, what do you think of this electrical grid thing? Submitted by westward on Sat, 06/25/2011 - 00:05. WASHINGTON -- A yearlong experiment with the nation's electric grid could mess up traffic lights, security systems and some computers -- and make plug-in clocks and appliances like programmable coffeemakers run up to 20 minutes fast. "A lot of people are going to have things break and they're not going to know why," said Demetrios Matsakis, head of the time service department at the U.S. Naval Observatory, one of two official timekeeping agencies in the federal government.